For their end-of-the-season awards, the Patriot League released their postseason all-Patriot League teams for both academics and athletics, and unsurprisingly, Lehigh athletes put plenty of athletes on both lists. Seven Lehigh athletes made the first team offense and defense: senior WR Ryan Spadola, senior OL Mike Vuono made it on offense, and senior DT Sajjad Chagani, senior DE Tom Bianchi, senior LB Billy Boyko, senior CB Gabe Johnson and senior FS Billy O’Brien cracked the first team. Senior QB Mike Colvin, senior LB Sam Loughery, junior LB Nigel Muhammad and sophomore OL Ned Daryoush all made the Patriot League second team, while Spadola and senior RB Zach Barket made the more important list: the Patriot League All-Academic team. More academic awards and athletic awards await, but congratulations on these awesome Lehigh athletes for what they’ve accomplished. Down 14-3 and 21-10, early on it looked like Lehigh’s playoff hopes, already dimmed by the Mountain Hawks’ loss to Colgate, might be done in completely at the hands of their bitter rivals, who were looking for their first win over Lehigh after being unsuccessful in their last four tries. 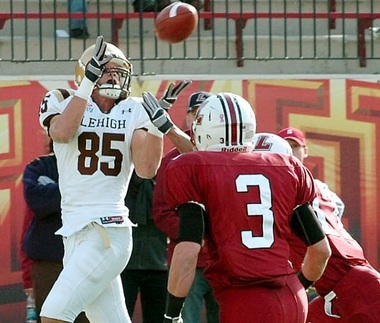 Then Lehigh put together their best half of football of the year. Scoring 28 unanswered points, and shutting out the Leopards in the second half, the Mountain Hawks finished the regular season with a resounding 38-21 victory. Ultimately, it wasn’t enough to get to the postseason, even though it would have been for the first time since the playoffs expanded to 20 teams that a team with 10 Division I wins would not qualify for the FCS playoffs. But that shouldn’t obscure a fantastic effort by Lehigh’s class of 2013 to stay undefeated against “That School in Easton” and their achievement of being only the 10th team in school history to break the 10 win barrier. After the weatherman promised a mostly sunny day on November 10th, the day of the Patriot League championship game at Murray Goodman stadium, there was instead a gray haze that persisted throughout the football game. Like the weather, the game was also a story of the unexpected. Few thought the Colgate offense would be held to just 35 points, after creaming Lafayette for 65 points the previous week. Many also were surprised that Lehigh could only manage 90 rushing yards against the No. 7-ranked rushing defense in the Patriot League. The grey weather didn’t affect the outcome. It didn’t affect the passing game, the running game, or the kicking game. But on a damp, strange, overcast day in November, the magic ran out for Lehigh. The undefeated Mountain Hawks fell in a war on Saturday, 35-23, busting up a season that almost seemed predestined to be Lehigh’s from the outset.